You’ve decided to ‘rough it’ for a few days and go glamping with a group of your closest friends. Sounds like great fun, doesn’t it? It does, but if you’ve never been glamping before, what do you pack? Do you have to spend a fortune on camping stuff. With so many questions in mind, here is a quick checklist to help you get started on your glamping weekend adventure. There are two ways to go glamping; take your own tent and your favourite home comforts, such as pillows, hot water bottles, blow up mattresses and lots and lots of toilet roll, or book with a company that specialises in glamping holidays and offers some of the most popular glamping accommodation. This includes yurts, camper vans and other luxury venues. As you’re just going away for the weekend, ease yourself in gently, and go with a specialised company, who can give you the most comfortable introduction to the glamping trend. If you’re super organised, make a meal plan before you go and prepare the food before you pack. You might not have a lot of space, or even time to prepare your meals once you arrive at your campsite, so make it easier for yourself and your camping buddies by chopping vegetables and putting them in clearly labelled tubs before you leave. All you have to do come dinner time, is find the right tubs of food, pour the contents into a saucepan and start cooking. This will save you so much time, that you can afford to sit back and relax and indulge in a couple of glasses of your favourite Shiraz wine, that you can pick up at a local retailer like Tesco. After all, what defines glamorous camping more than a few nice bottles of wine? Yes! A glamping weekend is all about gadgets, and while a phone is an integral part of glamping, more basic gadgets that you need include fairy lights, that will help you find you way back to the tent in the evening and a trusty Swiss Army Knife that can have all sorts of uses, from opening tins to filing your nails. If you’re worried about your phone running out of juice, invest in something like a powerpack, specifically one with solar panels, which can power your phone even when there are clouds in the sky. Glamping is essentially the 21st century update to a centuries-old tradition. 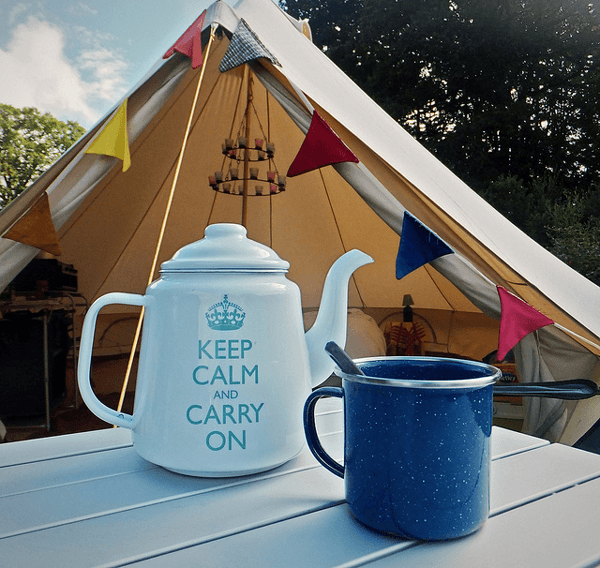 But living in the great outdoors for a few days doesn’t have to mean that you have to compensate on your home comforts, so, think ahead, prepare and find the right glamping site for you. Images by Inspired Camping and Donna Tomlinson used under the Creative Commons license.